the immunological destruction of transplanted organs or tissues. The rejection may be based on both cell-mediated and antibody-mediated immunity against cells of the graft by a histoincompatible recipient. First-set rejection usually occurs within 10 days. Second-set rejection occurs within 1 week after a second graft with the same antigenic specificity as the first is placed in the same host. Rejection Clinical immunology The constellation of defenses mounted by the immune system of the recipient of an allograft–eg kidney, liver, pancreas, etc, which compromise the continued viability of grafted tissue. See Graft. Therefore, it is possible to hatch chicks following somitic manipulations without the problem of species-specific graft rejection (Kinutani and Le Douarin, 1985). A snapshot of the global therapeutic scenario for Corneal Graft Rejection. In the present study beside 6 cases of graft rejection, there were 4 cases of wound infection, 6 of them had postoperative vertigo, 5 patients suffered from disturbances in taste sensation post operatively and 2 cases had sensorineural hearing loss. Serum enzymes such as amylase and lipase lack sufficient specificity or sensitivity to serve as sole markers for ACR (5), and recurrent hypoglycemia is a late consequence of graft rejection (6). Graft rejection can be difficult to discern during pregnancy because serum creatinine levels are low during this period, and small changes can be missed, Dr. Among the 14 failures, the graft was only partially taken up in 10 patients, which left a relatively large perforation that did not heal even after repeated cautery; the other four patients experienced a complete graft rejection because of gross sepsis in the middle ear. In immune compromised individuals, such as transplant recipients or those with leukemia or HIV infection, CMV can cause serious life-threatening disease and may significantly increase the risk of graft rejection. Postoperative Complications: Formation of double anterior chamber, Corneal stromal graft rejection, Recurrence of the original pathology, Graft dehiscence, Interface haze, Descemet's membrane folds. They are used to detect HLA antibodies which may cause graft rejection. 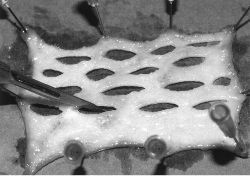 1 When vessels are present on the cornea, the chances of graft rejection are very high, and it is considered a high-risk corneal graft surgery. We re also doing basic science research to develop a new cell-based therapy to prevent graft rejection for both stem cell and solid organ transplantation.